Pink eye or conjunctivitis is a transmittable condition characterised by pink or reddish coloration of the conjunctiva. The conjunctiva is the clear membrane that covers the white of the eye and also lines the inside of the eyelids. A virus, bacteria or allergy could cause pink eye. It can be transmitted through various means such as using an infected washcloth, towel or using table tops, bathrooms and so on, touched by the infected person. It can also spread when the person infected with pink eye coughs or sneezes. Both bacterial and viral infections associated with pink eye often occur in conjunction with colds and upper respiratory infections. When a person is afflicted with pink eye his / her eyelids become puffy, the eyes take on a pinkish tinge (hence, the name, ‘pink eye’) and the eyes feel heavy and sticky. The stickiness is particularly obvious after waking up from sleep. The symptomatic aspect of pink eye varies depending on the underlying cause. For example, when conjunctivitis is caused by an allergen, both eyes are likely to be affected. Itching, redness and excessive production of tears may be present. When a viral infection is the underlying cause, pink eye may be localised to one eye and may be evidenced by excessive watering and redness.The patient may have a whitish discharge from the eyes. 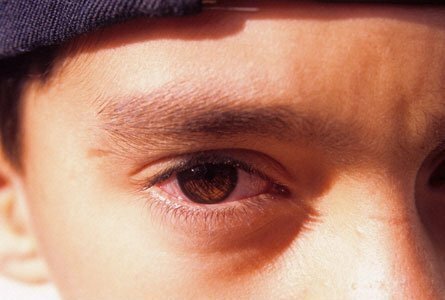 Bacterial infections are likely to affect both eyes and a grayish or yellowish colored discharge may also be present. cold or warm compress: Both cold and warm compress can be used to provide some relief from pink eye. If allergens are the problem, cold compress may feel more soothing. If the pink eye is caused by an infection, a warm, moist compress will soothe the eyes and help to reduce redness and inflammation. Be sure to use separate compresses for each eye as warm, moist compresses can spread infection from one eye to the other. Ensure the compress is clean. cleaning eyes: The person afflicted with pink eye should carefully wipe from the inside, next to the nose, toward the outside. The clean surface of a cloth should be used for each wipe so that the discharge from the eye is cleaned properly. The discharge must not rubbed across the eye again. The patient should not leave used tissues or wipes lying around and should dispose them properly. While using a washcloth, the patient should be careful and make sure that it is not touched or used by others. To prevent pink eye from spreading, the patient should wash his / her hands with an antibacterial soap, every time he / she wipes the eyes. honey: To provide some relief from the pain and inflammation caused by pink eye, another option is to use honey. 1 teaspoon of honey should be added to half a cup of water. Two drops of this solution can be put in the infected eye. This may cause some stinging but it is an effective home remedy for pink eye. The process can be repeated several times in the day to provide relief. homeopathic remedies: Homeopathic remedies that can be designed to treat pink eye include Pulsatilla, Belladonna and eyebright. Homeopathic eye drops and eye washes can be made from eyebright or camomile also. castor oil: A drop of castor oil in the infected eye once a day is said to aid in healing the infection quickly. Boric acid: Boric acid can be used as an eyewash to relieve the discomfort associated with pink eye. It does this by cleaning and soothing the infected eye, providing similar results as a warm compress. tea bags: Tea bags can be dampened and placed on the eyes to ease the discomfort of conjunctivitis caused by allergens. Boil the tea bags and allow them to cool before placing them on the infected eye. eyebright (Euphrasia officinalis): Add a few drops of eyebright tincture to boiled and cooled water. Soak cotton balls in the mixture and apply it to the infected eyes. This is an effective way to cure pink eye. salt water: Cotton balls can be soaked in boiled salt water and placed on the eyelids of the affected eyes to kill the infection. Being afflicted with pink eye or conjunctivitis can be quite annoying and cause a great deal of discomfort and pain. The above mentioned home remedies can help to ease at least some of the discomfiture and provide relief from the pain, itching and inflammation.